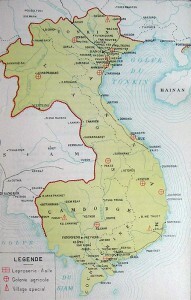 The leprosy asylum of Culao-Rong in Cochinchine was established on May 14, 1903, on an island (Culao-Rong or Dragon Island), four kilometres by 400 metres, and about eighty hectares, close to the province of Mytho, in the Mekong delta. 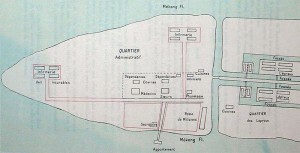 The buildings were situated on the eastern side of the island, as far away as possible from Mytho village. It would only take twenty minutes by motor boat to get there from the village. In 1930, a doctor, two French religious sisters of the order of Saint Paul de Chartres, three indigenous sisters and five indigenous infirmiers attended the people who suffered from leprosy. A European provincial doctor visited each week or at any time he was called in an emergency.